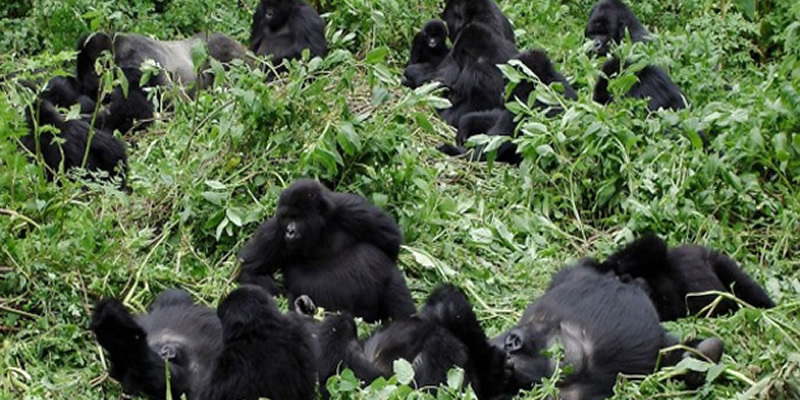 16days uganda - ruanda gorilla safari tour - Nile river, rhinos, wildlife, primates, gorillas, lake Kivu & kigali city tour. Day 2: Entebbe to - Source of Nile river - Jinja. Day 3: Nile river - Murchison fall national park, viaZiwa rhino santuary. Day 4: Morning game viewing & Afternoon boat cruise to bottom of the falls. Day 6: Hoima to - Kibale national park- the capital world of primates. Day 8: Drive proceed to - Queen Elizabeth national park. Day 9: Wildlife game viewing safari & Afternoon boat cruise on Kazinga channel. Day 10: Queen Elizabeth to - Bwindi - via ishasha sector for tree climbing lions. Day 11: Morning Gorilla trekking & Evening community nature walk. Day 12: Bwindi to - lake Bunyonyi - canoe ride on lake bunyonyi. Day 13: Bunyonyi to Rwanda border - Ruhengeri (PNV). Day 14: Gorila tracking (Diana fossey ) as an aoption if not interested in two treks. Day 15: Ruhengeri (PNV) drive to - Lake Kivu beach. Day 16: Kigali city tour - Depart at Kigali airport. Day 2: Pick up from hotel address in Kampala / Hotel address in Entebbe - Going on to Jinja - Source of Nile river and visit source of river Nile. After an early breakfast, you will embark on the drive to Jinja. Along the journey, visit Mabira forest (nature guided walk on that day. You will go and visit the source of River Nile, the longest river in Africa. you will enjoy warm lunch at the source of river Nile. Retire for dinner and overnight in Jinja. Category: (Jinja Nile Resort- Luxury option), (2Friends Hotel - Midrange option), (Jinja Paradise Hotel - Budget option). Day 3: Drive to Murchison falls park, Via Rhino Sanctuary at ziwa. On this day, our company guide will meet you at your hotel/ address, then drive your to the world’s most powerful waterfall. Along the way, visit the Rhino Sanctuary You will enjoy hot lunch during this short break. Later Porceed to Murchison falls national park and rest at the booked lodge. Have dinner and an overnight stay at the booked lodge, Category: (Paraa Safari Lodge - Luxury option), (Pakuba Safari Lodge - Midrange option), (Red Chill Rest Camp - Budget option). Day 4: Game viewing and boat cruise. On this day, take pleasure in a morning game drive towards the Albert and Victoria Nile and experience a great deal of wildlife and birds. Along the way, look out for herds of elephants, giraffes, antelopes, the Uganda Kobs, buffaloes, waterbucks, lions, and several bird species. Later on in the day after lunch, embark on a boat cruise to the bottom of the falls. This 3 hour cruise from Paraa is a rewarding trip that will expose you to many various wildlife species like hippos, crocodiles, elephants (though quite occasional along this side) and a variety of the bird life that may include the African fish eagles. You will then return to the lodge for wonderful dinner and peaceful overnight at the booked lodge..
Day 6: Chimpanzee trekking activity and Nature guided walk. WToday the forest opens its doors for sensational chimp tracking. Kibale Forest is reputable for having the greatest variety and highest concentration of primates in East Africa. Enjoy a guided nature walk in the tropical rainforest in search of the wild chimpanzee, redtailed monkey, black and white colobus monkey and many others. After lunch we transfer to Bigodi for a complete different walk. Here you will have the choice to join a guided Swamp Walk through the Wetland Sanctuary, which is famous for the many birds and primates that live in this area. Alternatively, you may decide to go for a Village Walk. Accompanied by a guide who can tell you everything about the traditional customs and lifestyle of the inhabitants, you will follow the village path and visit a primary school, Catholic church, traditional homesteads, learn about the crops and listen to the story telling of a Mzee (elderly man). Both activities are an initiative of the inhabitants of Bigodi Village and the revenues are shared by the local community (you can choose which activity to join locally. This is included in the package). Return to the lodge for diner and peaceful overnight stay. Day 7: Transfer to Queen Elizabeth park, Visit Mount Rwenzori Foothills. Today you can enjoy the majestic Rwenzori Mountains in their full glory on a guided walk in the foothills of the 'Mountains of the Moon'. As well as enjoying the scenic views, we will get a glimpse into local village life and meet some of the locals and visit a waterfall. After this walk we transfer to Queen Elizabeth National Park, where we spend the next two nights. Thereafter, embark on the journey to Queen Elizabeth game park, This is where you will enjoy sight seeing of wild life. Dinner and overnight at the booked lodge peaceful overnight at the booked lodge. Accommodation at: booked lodge. Category: (Mweya Safari Lodge - Luxury option), (Enganzi Lodge - Midrange option), (Pumba Safari Cottage - Budget option). Day 8: Morning game drive and Afternoon boat cruise on Kazinga channel. At the park, you shall enjoy a game drive towards the Kasenyi plains which may reward you with sightings of the various animals like huge herds of the Ugandan kob, elephants, leopard, lion, buffalos, warthogs and antelope etc. Later after lunch, you will embark on a boat cruise on Kaziga channel. This is very rewarding with the aquatic animals like crocodiles, hippos and many bird species like black bee carmine bee eaters and black bee eaters, Lesser Swamp-Warbler, Striated Heron among others. You will return to the lodge for dinner and peaceful overnight. Day 9: Transfer to Bwindi Forest National park. After breakfast we head towards the south, passing the southern sector of the National Park (if road conditions allow). This part is called Ishasha and is famous for the tree climbing lions. After a short game drive in this area we continue to Bwindi. While driving through a verdant countryside, you will pass traditional homesteads and enjoy panoramic views. In the afternoon we will arrive in Bwindi National Park, the home of the endangered mountain gorillas. Accommodation at the booked lodge. Category: (Silverback Lodge - Luxury option), (Buhoma Haven Lodge - Midrange option), (Buhoma Rest Camp - Budget option). Day 10: First time Gorilla tracking in Uganda - Life-time memorable experience. After morning breakfast, you will get ready, along with your packed lunches to embark on the lifetime memorable experience in this magnificent forest for gorilla tracking. The trail you use may reward you with exciting moments of the giant mountain gorillas in uganda this will be a reward of the ultimate gorilla experience’ as well as other primates that inhabit the forest. This may take you about 4-5 hrs in the jungle. You will return to the lodge for dinner and peaceful overnight at the lodge. Accommodation at the booked lodge. Day 11: Going on to Lake Bunyonyi. After breakfast we depart to Lake Bunyonyi, the second deepest lake in Africa. The drive itself is very scenic through small villages, coffee and banana plantations and rolling hills. Upon arrival there should be ample time to relax, visit the local village or explore the surroundings by traditional canoe. Category: (Bunyonyi Birdnest - Luxury option), (Bunyonyi Safari Resort - Midrange option), (Bunyonyi Gorilla View Resort - Budget option). Day 12: Border crossing to Rwanda from Uganda. Transfer to Rwanda for the following day’s tracking. These groups of gorillas in Rwanda are easier to track and so will reward you with a more interesting experience with out much trouble. The driver will drive with you to your lodge for your dinner and wonderful overnight.. Category: (Mount Gorilla View Lodge - Luxury option), (Le Mbabou Gorilla Lodge - Midrange option), (Kinigi Guest House - Budget option). Day 13: Second time gorilla trekking in Ruanda. On this day after enjoying a very early breakfast, the driver/ guide will be ready to drive you to the headquarters of Parc Nationale des Volcans for the memorable gorilla tracking experience. Tracking in Rwanda is a much rewarding experience especially when combined with a visit to the Dian Fossey cave. Brief update on Dian Fossey: she was an American zoologist who had committed all her life to Gorilla conservation and habituation in Rwanda. She is famously known for her work in habituating gorillas (you might want to see “Gorillas in the Mist movie”). She was murdered in Rwanda in the Volcano Mountains believably by Gorilla poachers and was buried in a cave beside “Digit” her Gorilla friend who passed on in 1977. A visit to this cave will probably be a major highlight while in Rwanda. After the briefing from the ranger guides at the park, you will start the gorilla trekking (with your packed lunch) through the light mountain forest on the slopes of the Virunga. Hiking and tracking gorillas may take 1-8 hours or less and this mainly depends on your physical ability and stamina (it can be shorter). The driver will return with you to your lodge for your tasty dinner and wonderful overnight. Accommodation at: the booked lodge. Day 14: Going on to Lake Kivu for relaxing Lake kivu is the largest, is like a giant inland sea with some interesting lakeside towns. Kibuye, two hours from Kigali, is a relaxing retreat for swimming, canoeing and water-skiing. Gisenyi, a famous resort in the past, now has a sleepy forgotten air with some fine but neglected buildings from the Belgian era. dinner and wonderful overnight at the booked lodge/hotel. Category: (Kivu Serena Hotel - Luxury option), (Paradise Hotel - Midrange option), (Paradise Hotel - Budget option).